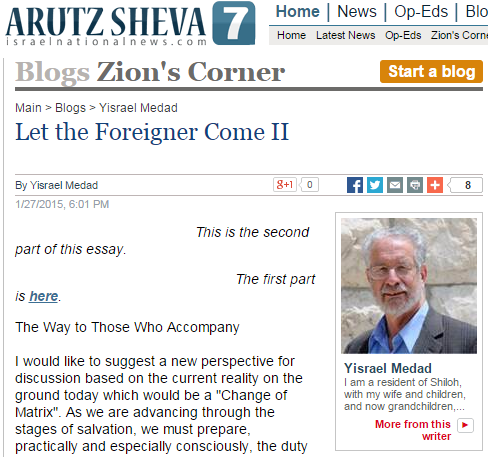 A recent 2 part post entitled “Let the Foreigner Come” by Yisrael Medad toys with a guilt complex that some Jews feel with regards to Evangelical and / or Messianic believers of Jesus and Yeshua respectively loving and blessing Israel. In particular, the guilt complex is driven in part by the actions of a pro-Israel/ Zionism group called HaYovel who help Jewish farmers in the growing and harvesting of grapes in Judea and Samaria. The guilt complex developed with an idea that somehow we Jews are not being grateful, accepting and in fact we are quite the opposite; we go out of our way to make things as tough as possible for those of the pro-Israel/ Zionism who are just loving and blessing Israel. Our mission is to take an active role in, and educate people about, the prophetic RESTORATION of the land of Israel that is happening TODAY!…….. We give thanks to God Almighty who, by His great mercy has allowed us to take part in the restoration of Israel! To the members of HaYovel they are part and parcel of the prophetic restoration of Israel. The website of HaYovel is very parve [neutral] so that one would scarcely get the idea that HaYovel and the visiting groups of Christians from different parts of the world have no intention to proselytize Jews in Judea, Samaria and beyond. Moreover, the holy ground created by this neutrality of non-proselytization is such that we are, if we are to be deemed as ‘good Jews’ will not even mention the odd slip up of missionary zeal that sometimes plops out, of the various organs of these pro-Israel/ Zionism groups. The nerve of the pro-Israel/ Zionism groups even extends to demanding the removal of the word ‘missionary’ from one of their videos which plainly demonstrate their missionising agenda. In other words we Jews are supposed to play along with the double standards of these pro-Israel/ Zionism groups. Further, the muti-million dollar success of the HaYovel and others should also make us keep our mouths shut too to the sometimes well hidden missionizing agenda of these groups. Is it right to conclude that the idea of Christians working for us is better than having Muslims working for us? The idea of Christians working for us is better than having Muslims working for us, is in a round about way also an acceptance of the Christian understanding of prophecy by allowing Christians who come to Israel to work on our land. 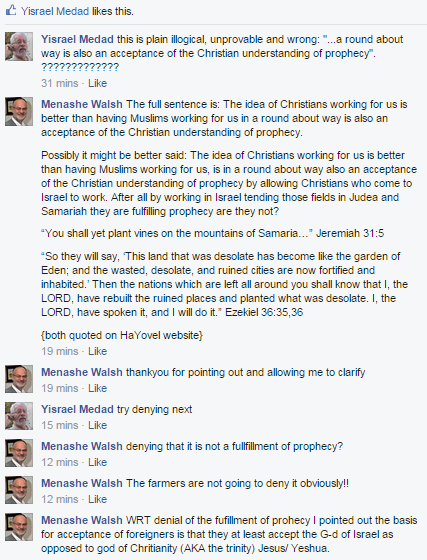 After all by working in Israel tending those fields in Judea and Samariah they are fulfilling prophecy are they not? The modern day spectacle now sees some Jews being paid off to turn a blind eye to the missionary agenda of the pro-Israel/ Zionism groups and accept Christian New Testament theological projections and ideas onto our Scriptures and History which in effect nullifies our existence and validity as the people who G-d has chosen. We must not forget that behind all this loving Israel and blessing Israel is ultimately the hatred of Israel by the apparent love of Israel by these pro-Israel/ Zionism groups. In reference to the false idea of Christians working for us is better than having Muslims working for us may indeed establish an even worse situation whereby the silent “Holocaust of Love” is far more pernicious than the “Holocaust of Hate.” Added into this mix is the hatred and division which we have among ourselves as Jews. The prophet Malachi predicts that towards the end of days, when Elijah comes, there will be a return to Judaism where parents and children will interact with each other, and will be attracted to each other through the word of G-d. The night is divided into three watches, and at every watch G-d sits and roars like a lion…. The signal (for the commencement of each watch is as follows): At the first watch, a donkey brays; at the second watch, dogs bark; at the third watch [near dawn], an infant suckles from its mother and a wife chats with her husband. 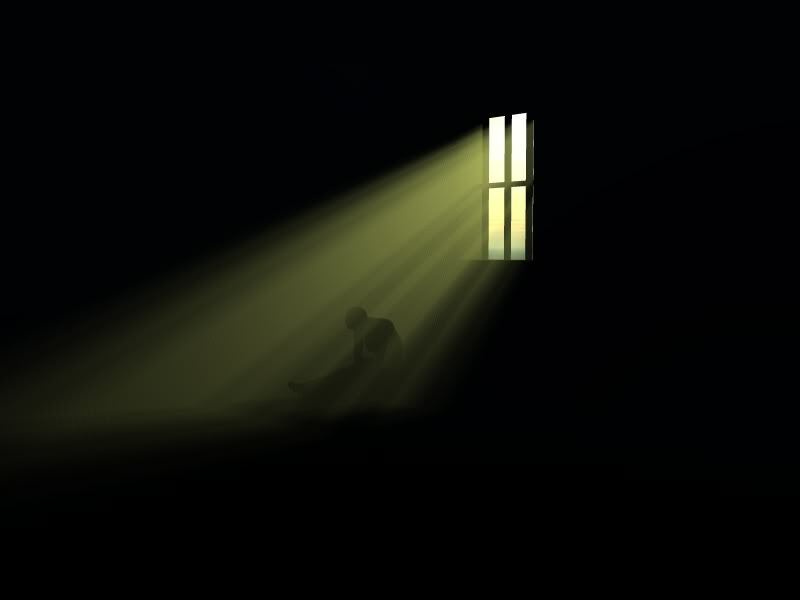 The Artscroll overview of Tishah Ba’av cites the Maharal (Rabbi Yehuda Loewe 1526-1609), the famous rabbi of Prague, who explains in his book Netzach Yisrael that the allegory of night represents the bleak, gloomy exile, foreshadowing the great darkness and despair in which Israel will sink. Says the Maharal, just as the night proceeds to get darker, so our exile, gets progressively worse. The beginning of the exile is portrayed as a donkey braying in the night, symbolizing that our oppressors will initially treat us like beasts of burden, confining us in ghettos and assessing discriminatory taxes upon us. The second stage of exile is symbolized by barking dogs, since dogs bark madly at the sight of death, as our enemies seek to kill us through pogroms, blood libels, inquisitions, genocides and holocausts. The third and most terrible stage is represented by the wife who chats with her husband. It predicts that when our enemies fail to destroy us physically, they will attempt to destroy us spiritually. The silent “Holocaust of Love” is far more pernicious than the “Holocaust of Hate.” Assimilation and intermarriage will decimate the ranks of the Jewish nation like no other scourge. But while the wife chats with her husband and intermarriage becomes rampant and Jewish life hemorrhages as a result of assimilation, an infant suckles from its mother. Just when it seems that all hope for a Jewish future has faded, a faint glimmer of light appears, and a small number of Jews, even the most assimilated and alienated Jews, will be touched by Torah, and will be drawn back to traditional Jewish life. This return movement will bring an end to the darkness of exile and herald the dawn of redemption. Interpretation of prophecy is a difficult thing. Indeed if a Jewish perspective is concerned as a principle in trying to ‘work it out’ we are advised to stay away from it, more so especially if it concerns specifically working out the end. From the same verse quoted in Yisrael Medad’s post to try and justify the present treatment of Christians by Jews we may derive some caution in regards to HaYovel’s somewhat inflated idea that they are part and parcel of the prophetic restoration of Israel! To know the name of Hashem, to fear Hashem in the verse above is the same for both the stranger/ foreigner as it is for the people Israel, i.e. the Jews! A fact presently is that there is no equivalence between the divine human god Jesus/ Yeshua (the third person of the trinity) and the G-d of Israel. We are not worshiping the same G-d! Meanwhile they the pro-Israel/ Zionism folks are so blinded by their beliefs and invest huge amounts of energy in hiding their agenda to convert Jews to Christianity. What are the differences between the various the pro-Israel/ Zionism groups? Simple! Some are better at hiding their agenda than others and some Jews are dumb enough to go along with it in the vain hope that eventually the Christians will change at some point. It is also kind of ironic that according to the theology[5a] of these Christians, the person allowing the building of the 3rd temple, upon which is the name of G-d is the anti-Christ, whereas for the Jew the person building the 3rd temple is the Messiah/ Moshiac. The end will only really be the end when ‘apparently’ our well meaning but devious enemies say to G-d: “Our fathers have inherited nothing but falsehood, Futility and things of no profit.” Can man make gods for himself? Yet they are not gods!… Jer 16:19, 20……..meanwhile the cycle of both the “Holocaust of Love” and the “Holocaust of Hate”………continues right to the end! The results of the 2014 harvest labor of Hayovel volunteers was 438 tons of grapes which should produce at least 258,000 bottles of wine. Since 2004, they harvested over 2000 tons of grapes and olives which represents 156,000 work hours, saving labor costs of $1,100,000. [5a] According to Pastor John Hagee et al. God’s program continues in Daniel 11 verse 31, where Daniel describes the violation of the sanctuary and G-d’s people using the same terminology that he uses in Dan 9:26, 27). The violation of the sanctuary and G-d’s people is to take place at the close of the 490 years (Dan 11:31, 32), followed by a refining process (Dan 11:33-35). The refining process represents God’s program for the ultimate expiation of sin and for the salvation of mankind. The refining process by ‘flame, by captivity and by spoil‘, is for ‘many days‘; (verse 33) and continues ‘even to the time of the end‘, (verse 35).